Jeri Smith-Ready: New WVMP short story! Back in July, I coincided my announcement of an anthology short story sale with LeBron James's announcement that he was leaving the Cleveland Cavaliers to "take his talents to South Beach" (whut-EVerrr). In a bizarre confluence of sporting and publishing events, that short story was published yesterday, the same day that LeBron James had his regular season debut with the Miami Heat. As Spike Lee said of the 2004 ALCS, "You can't script this stuff!" Let's just hope that "Thief" and its YA vampire anthology, Eternal: More Love Stories With Bite has better luck than LeBron and the Heat, who lost to the Boston Celtics last night (woo-hoo! Go Celtics!). Eternal is already shipping from online booksellers and can be found on the shelves of many Barnes & Nobles and Borders. As always, you can get signed copies from my local indie bookstore, Constellation Books, or order from Mysterious Galaxy, Amazon.com, or Barnes and Noble. 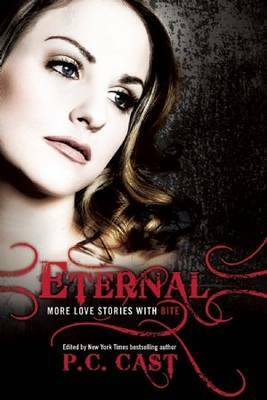 Eternal is edited by the fabulous PC Cast, author of the #1 New York Times-bestselling House of Night series. The anthology will be listed under her name, so if you go to your store to ask for it, ask for "Eternal: More Love Stories by PC Cast." Don't ask for the latest Jeri Smith-Ready book, because they'll give you Bring on the Night (which you should probably buy, anyway, while you're there, if you don't have it, just to be safe, just sayin'). The anthology includes stories by Heather Brewer, Rachel Caine, Claudia Gray, Nancy Holder, and Lili St. Crow. They are all awesome, but you could've guessed that. "Thief" is set within my WVMP Radio universe, but it's a YA story, so obviously it's not about Ciara. The narrator is her sixteen-year-old cousin Mary Cassidy O'Riley (aka, "Cass"), an Irish Traveller from South Carolina's low country. As is mentioned in the early WVMP novels, Ciara's parents are members of this mysterious, reclusive group of Americans who are often mistakenly called "Gypsies" due to their nomadic existence and their reputation of, uh, trickery. Of course, it's never fair to paint an entire people with one negative brush. Plenty of Travellers lead perfectly respectable, legitimate occupations. They're devoutly religious and dedicated to the well-being of their families. But any Traveller will tell you there are always bad apples. It's true what I said, that not all Irish Travellers are thieves. Thanks to the media and a few big arrests by the feds (I miss you, Granddad! ), people think all any of us do is run scams and pick pockets. But it's not totally true. Travellers just have a bad reputation. One we O'Rileys aim to live up to. Imagine Ciara with curly hair and no conscience. If you like Cass, you'll see more of her in the next WVMP book, Let it Bleed, coming out in August of next year. But you don't have to have read any of the WVMP novels to read the story, or vice versa. "Thief" stands completely alone. Check out my website's Eternal page and the original announcement post for more details. If you get a chance to pick it up, drop me a line and let me know what you think. Hope you enjoy!